First brewed way back in 1991, Sam Adams Cream Stout is a survivor. Sam Adams pitches this as "the cappuccino of beers." From what I can tell, there is no lactose added to the beer, so I believe they are handling those qualities with a clever malt bill. Roasty, smooth and sweet [with] a fullness of body, a roasty malt character and rich, creamy head. Its dark, mahogany color makes it almost as easy on the eyes as it is on the palate. My mouth is watering, so let's get started. Appearance: A deep brown, almost black body with the barest hints of ruby and brown highlights when held up against the light. Up top, two fingers of pillowy caramel-tinged head with good retention and great lacing. Aroma: The classic Stout aromas are all in full effect here: chocolate, coffee, and dark-roasted malt. Taste: All of the same Stout standbys (chocolate, coffee, and roasted malt) with a good dose of lactic sourness thrown in. Towards the end, the mild hops come in to add some bitterness for added complexity. The aftertaste features a nice flourish of milk chocolate and then fades to bitter coffee. Mouthfeel: Medium bodied with smooth carbonation. A creamy, slightly sweet finish. Drinkability: If you're into Stouts, this is plenty sessionable. 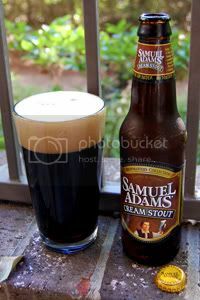 Verdict: Samuel Adams' Cream Stout, like most Samuel Adams offerings, is a solid and tasty enough rendition of it's style. It's not a world-shaker by any means, but it's a very likable brew, and I'll be looking forward to it in future Sam Adams mixed packs.